Heck, you can fill in the rest of that quote. I am also a big fan of ‘perseverance furthers” from the I Ching. Yes, I will stick with something until I get it done, whether it is digging a ditch, writing or publishing. My aim is for a successful conclusion. That is especially true these days. 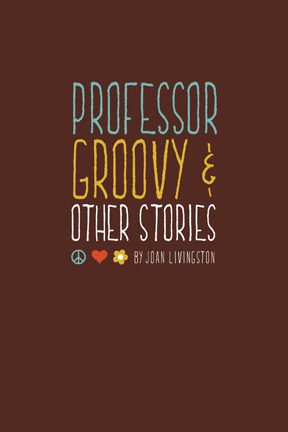 I wrote a little while back about trying to record an audio book for Professor Groovy and Other Stories. The editing was a killer. Even so, I didn’t like the end result. So, I pulled apart my office-turned-studio and took a weeklong break. In the meantime, I did more research about breathing (yeah, you gotta breathe, but just do it naturally) and other related stuff like drinking Throat Coat Tea beforehand. It’s amazing what is available on blogs and YouTube. Then, Friday night, I brought every piece of foam (like the seats from the couch), pillows and blankets we have into the office. Now, it looks like the bedroom some of my kids had when they were teenagers. Ah, but there’s no echo. Saturday morning I was ready to roll. I set up tracks with the right settings. I did a few practice runs. I did better on the breathing so I didn’t sound like I was gasping at the start of each sentence. A couple of the tracks came out great, the others, not so great. I checked and found the problems in the settings. So, on Sunday — I told you I’m persistent — I did new recordings and redid the unsatisfactory ones from the day before. I haven’t started the editing yet, but I can tell after listening, this will be a breeze compared to the first time I tried this. What else is a do-over these days? A Kindle Countdown. I tried one in May for Peace, Love, and You Know What, but got the dates mixed up so I wasn’t doing promotion until the end. Well, that was a waste, but a lesson learned. No, I don’t make a lot of money on this. But my goal is to attract readers. Thirdly, an update on another do-over: reading my novel The Sweet Spot backwards. It is slower-going than reading it forwards, but I highly recommend it. I find that I concentrate simply on the words in that paragraph and not the plot. I am pleased at what I’ve found so far, not a lot of changes, but significant ones. 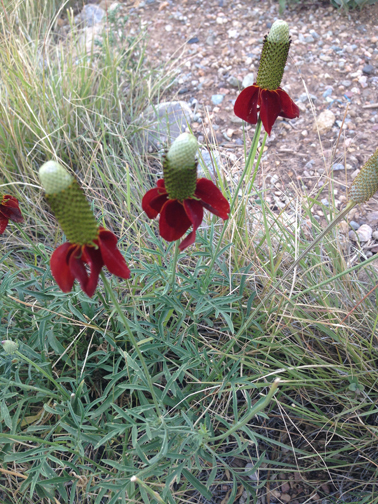 ABOUT THE PHOTO ABOVE: I snapped this shot of Mexican hat flowers growing in the front yard. 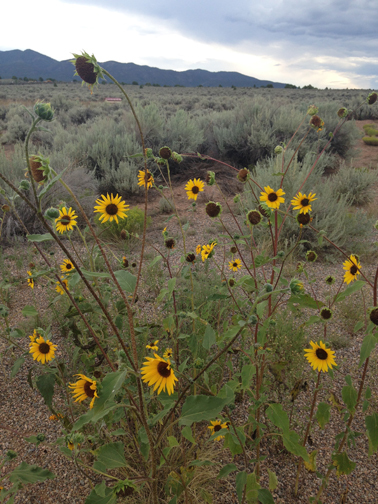 They grow wild here. Where have I been the past week? 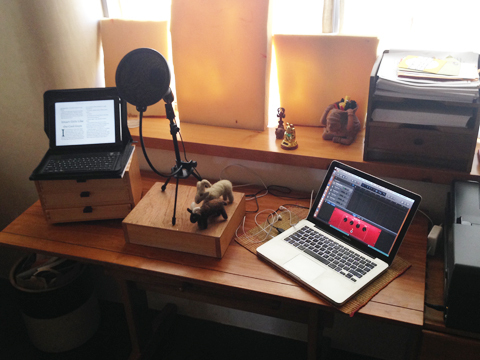 Holed up in my office-turned-recording-studio to create my first audio book — Professor Groovy and Other Stories. How am I doing? I’m getting very close to the end. Recording Professor Groovy has been time-consuming, especially the editing part. Hence, no posts and only minimal activity on Facebook, except to see what my digital friends are up to and to signify likes, happy birthdays, plus encouragement when needed. I have been out of the house on errands, my neighbor’s birthday party, and a friend’s house. (I brought my computer so she could hear what I’m doing.) I do try to take walks and spend some time in the vegetable garden. My office studio remains awash in foam. The curtains are drawn. The windows are shut. The door is shut too so the cat doesn’t jump on stuff although she is allowed inside during the editing process. As for equipment, I have the book on my iPad so I don’t have to rustle paper. The microphone has a pop filter and a cord leading to my computer. I do have to take breaks when the hot water heater on the other side of the wall fires up. But other than that, it’s a workable environment. This has been a learning experience, recording and editing on GarageBand. I downloaded the newest version, used the recommended settings, and had a go. There were lots of practice sessions and false starts. When I record, I stand in front of the microphone. I drink a lot of water at room temperature. I gargle with mouthwash. I avoid certain foods like dairy before recording. Still … I never thought I was a person with a mouth full of spit but there it was. Once I read to hold off drinking coffee before a recording because it is dehydrating. Well, that didn’t work. Besides I am not an opera singer. I started with the shortest story — Ripple in the Jungle — then worked my way up in length. I listened to the stories this afternoon. Three sound great. Alas, Professor Groovy needs to be re-recorded. I’ve tried and tried to fix things, but I have come to the realization it’s time to cut my losses and make a do-over. It just doesn’t have the same quality. Don’t ask me why. I am still new to this. ABOUT THE PHOTO ABOVE: My desk set up for recording. LINK: Thanks to those who have read my books. Here are links to Amazon. It’s healthy to be flexible. For me that means letting go of ideas and sometimes, possessions. 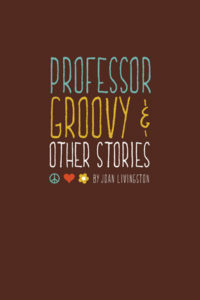 First, I am happy, thrilled really, that four short stories that have been languishing in my computer were published this week on Kindle this week via Professor Groovy and Other Stories. Versions of two did appear in magazines, but I want the greater world to read them. Being new to this type of publishing, I struggled with pricing. Really, what is something you write worth? Do you devalue it by selling it cheaply? But, hey, I am not a household name. So I dropped the original price from $1.99 to 99 cents in a matter of hours. My royalty on each book will be about 35 cents. Why settle for so cheap? Well, the four-story collection is only 10,000 words. And I have an ulterior motive. This book is bait for the novel Peace, Love, and You Know What. Then, there is my office. I am in one of those clean and purge moods. Friday night I took everything out of the office that I could — the living room looked like a bomb hit it — and then washed, waxed (furniture and the floor) and sorted as needed. I did windows. I will admit I went a bit nuts. And I took a good, hard look at the books in that room. Several I bought in a whim in a secondhand bookstore or online. I thought I liked the authors. But did I love them anymore? Not enough to hold onto their books. They’re in a bag to donate. There was other stuff set aside for the recycling center and drop-off boxes. I finally finished Saturday evening. Move energy and shake things up: I like that idea very much. ABOUT THE PHOTO ABOVE: That’s one of the robust zucchini plants in my garden.